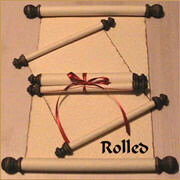 Regal Velvet Bag | 8 1/2 x 11 Rolled Scroll Fabric Bags | Scrolls Unlimited, Inc. This Regal bag is for royalty. It is made of velvet and a composition of metallic mesh crinkle fibers overlaid on sheer fabric on the central body of the bag. It is sewn in rounded bottom for nicer presentation.